Crucial has released firmware version 009 for the M4 SSD line. The firmware version jumps from 002 directly to 009, giving an indication that this is a significant update. The 009 firmware release notes make some big claims of improvement. We will test to find out if the new firmware improves the already fantastic drive. Increase in PCMark Vantage benchmark score, resulting in improved user experience in most operating systems. Improved write latency for better performance under heavy write workloads. Improved compatibility with latest chipsets. Compensation for SATA speed negotiation issues between some SATA-II chipsets and the SATA-III device. Improvement for intermittent failures in cold boot up related to some specific host systems. via Crucial.com Product Downloads – Firmware Updates. Installing the firmware was straight forward. Once the live CD starts it will try to locate if you have any upgradable drive installed. The is good job from Crucial and a big win for the end users. When I had purchased the Crucial C4, I found it a better value for money compared to OCZ Agility3. 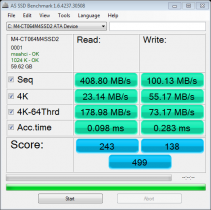 With this update, the Crucial C4 SSD is likely the best value for money SSD now. 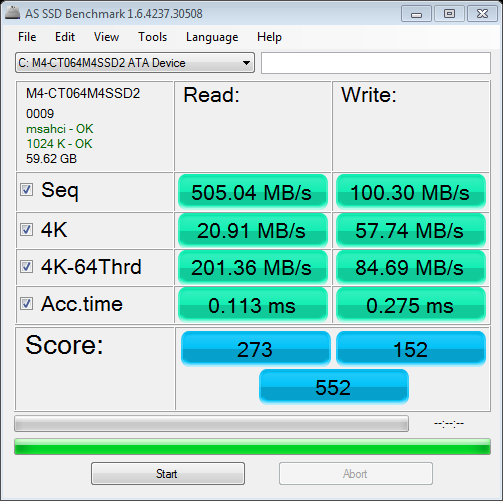 Results of read-only comparison between between Intel X25-V SSDSA2M040G2GC and Crucial M4 CT064M4SSD2 solid state disk drives (SSD). © 2019. Luhit – Reviews, Analysis. Powered by WordPress. Cleanr theme by WPShoppe.